Steve Marshall was ready. This time there would be no mistakes – no-one to derail the plan, and no-one to step outside his ideas for the perfect Britain. Anyone standing in the way of progress would be brutally mown down. Infiltrating the British Democratic Party was the ultimate solution to the establishment of a Fascist state – a state controlled by him and him alone. Marshall had toiled hard and long at the plan since the debacle of 1992. The Organisation had come within a whisker of success, and but for some strokes of outrageous fortune, MI5 and its head, the imperious George Watkinson, would have been all but consigned to history. This time it would be different. Neal James began writing in 2007 when a series of short stories found favour on a number of international writing sites. Since then, he has released five novels and one anthology. He has appeared in both the national and local press, and has also been a regular at branches of Waterstones and local reading groups and libraries in his home counties of Derbyshire and Nottinghamshire. 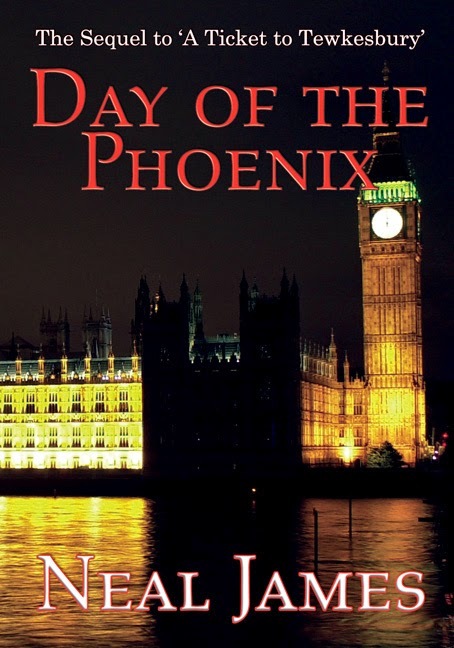 ‘Day of the Phoenix’, the sequel to ‘A Ticket to Tewkesbury’ has taken him into the realms of politics and the murky waters of espionage, and takes his 2008 novel to its logical conclusion. Find out more about Neal James and all of his writing on his website: www.nealjames.webs.com.